PRINT THE SELF-GUIDED TOUR BOOKLET OR PICK UP A BOOKLET IN HERRING HALL. When the University of Arizona was established as a Land Grant Institute in 1891, Dr. James Toumey, a botanist for the Agricultural Experiment Station on campus, recognized the value of the aesthetically unique vegetation that thrives here in the Sonoran Desert and started a cactus display garden that we now know as the Joseph Wood Krutch Garden. 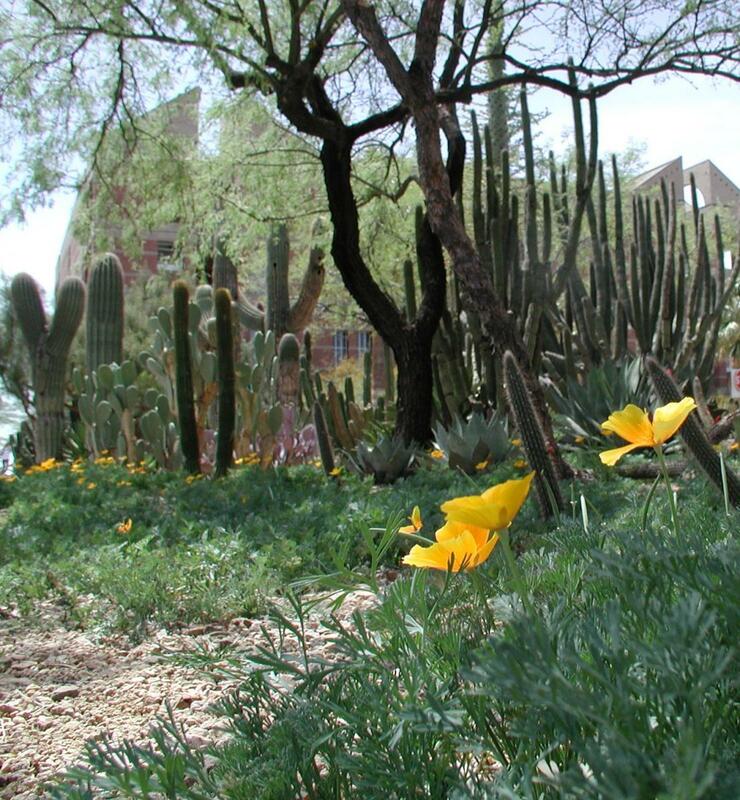 In the 120 years since the genesis of the University and its cactus garden, the University’s practices have advanced to reflect current and evolving understandings of and attitudes toward landscaping and the natural environment. By 1929 when the garden was moved from the west side to the east side of what is now Old Main, it boasted over 600 species. In its new location the cactus garden stretched from Old Main to Highland Avenue, and was embellished with walkways and benches enjoyed by both students and visitors to the campus. It was shortly after this move that one of the most celebrated species was added to the garden, when eight boojum trees were acquired on a Carnegie Desert Laboratory expedition to Baja California. The distinct-looking tapered trees are now rare and protected by the Mexican government. Construction started on the new Student Union in the 1950s, and part of the mall was grassed over. Some specimens were dispersed to other areas on campus, and some of the more important specimens were consolidated in a central oval. By the 1970s, the rest of the mall was filled in with turf, but the cactus garden in the central oval remained, and can still be enjoyed in the same location between the Administrative and Koffler buildings. In 1980, the garden was dedicated to Joseph Wood Krutch, an influential naturalist author who loved the southwest, and who left his papers with the U of A. More recently, the Krutch garden has withstood other proposals for its relocation. In 2001 plans were being made for a new Alumni Plaza, which would include a move back to the West side of Old Main. This inspired friends of the Krutch garden in the Arizona Alumni Association and the Campus Arboretum Committee to form the Krutch Garden Working Group, whose efforts resulted in the development of a general care plan and statement of goals for the garden in 2004, which included its expansion and improvement. More species were added to the garden in 2007 including ocotillo, hedgehog cactus, creeping devil cactus, senitas, and mammalarias during another “facelift,” and a previously undiscovered boojum seedling was found. The Joseph Wood Krutch cactus garden still stands as a symbol of the University’s responsibility as a Land Grant Institute to encourage land stewardship through research, education, and outreach, and of our continuing connection with our history, heritage, and responsibility as co-habitants of the Sonoran Desert. In the dry heat of June, before the monsoons, the Sonoran desert can certainly seem like a harsh environment. However, the native species that occur here today have adapted over millions of years to be able to thrive in the intense sunlight and heat, and through long periods of drought. For example, the creosote bush can survive for up to two years with no rain! Over time, interactions between the organisms here and the surrounding conditions have shaped this into one of the most green and diverse deserts in the world. Human inhabitants have been a part of this process for a long time. Early hunter-gatherers and agriculturalists paid close attention to the relationships between the plants, animals, climate, and natural rhythms of the Sonoran desert. Native plants were the main sources of food and medicine for people, and people selected seeds from the best crops to plant for the next season. As propagators, pollinators, cultivators, and indirectly, humans have played their part in the formation of the striking settings we find ourselves in today. In these modern times, we may forget that much of our medicine is derived from compounds found in plants, that our clothes are made from their fibers, that their fruits, stalks, leaves, and roots sustain us, as well as the animals we use for food, and innumerable species of wildlife. We may find ourselves searching for a fading connection to our environment. It’s only natural. The connection is still there, and we have the tools to cultivate it, as we continue the ancient dance of life. The Krutch garden, born at The University of Arizona almost as soon as the doors opened, has grown and developed with the University for 120 years. It stands as an insight into the past and a living laboratory testing sustainability into the future.